Magic was just around the corner…. Suddenly she has more friends, interesting neighbors and an intriguing love interest. But when the game begins to awaken something inside her, Kiri is shocked by the talents she never knew she had… and an evil she’d never imagined. Her nice, safe life is imploding around her-and if she takes up the mantle of her powers, it will never be the same again…. I have waited for this book. First, I waited for it to become available at Netgalley. Then I waited for my request to be either declined, or accepted. And there was much rejoicing when it was accepted..
And.. I devoured it. It was one of those books where you sit down to read, thinking I’ll just read a chapter, and the next thing you know you are on chapter 8. I enjoyed meeting the inhabitants of Mystic Circle again, and seeing them from Kiri’s totally human perspective. 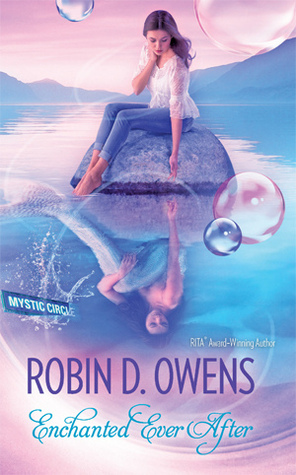 While I was familiar with the intriguing world of the Mystic Circle series, Ms Owens managed to make it feel brand new to me. It was fascinating, to get a glimpse of how Waterfolk lived. Both the weaker elementals, like naiders and naiads, as well as the Mer. The interaction between them gives a glimpse into the danger of angering someone at court. The plot was intriguing. I loved how they used a VR world to gradually introduce Kiri to the existence of magic. The gradually increasing sense of danger, even before Kiri transformed, kept me reading. I also enjoyed how Kiri struggled with her decision to transform, and the sense of uncertainty of what she would transform into. Kiri’s struggles with adapting to her new life afterward added another touch of believability to the story. Kiri and Lathyr’s romance was sweet, and I enjoyed following it from their first meeting, and to their HEA. That said, sometimes their romance felt too… subtle. It was there, but it felt like it got buried in all the other things that happened.